A 45-year-old male, was diagnosed as non-proliferative diabetic retinopathy (non-PDR), with a history of non-insulin-dependent diabetes mellitus for 10 years, well-controlled with oral medications. Both eyes were managed with pan-retinal photocoagulation (PRP). At presentation, his visual acuity was OD: 20/200 and OS: 20/320. Two weeks later, he was referred to our glaucoma clinic with further drop in vision and raised intraocular pressure (IOP) (OD: 52 mmHg, OS: 48 mmHg). Anterior segment examination revealed bilateral neovascularization of iris (NVI) with zippered angle closure on gonioscopy. A diagnosis of neovascular glaucoma (NVG) was established and the patient was started on maximal antiglaucoma therapy. He eventually underwent both eyes intracameral bevacizumab (1.25 mg in 0.05 ml) injection, followed by trabeculectomy + MMC. At 1 week follow-up, IOP in both eyes was12 mmHg with a well-functioning bleb. Systemic laboratory work up revealed a high total leukocyte count (TLC = 181,220 cells/μl) with increased blast cells (10%). The peripheral blood smears revealed marked leukocytosis with neutrophilia predominant population of myeloid precursors suggestive of chronic myeloproliferative disorder. He was diagnosed as CML by the hematologist and imatinib mesylate 400 mg OD (Imatib Alpha, Cipla Pharmaceuticals, India) was initiated. Owing to the financial constraints, quantitative BCR/ABL analysis could not be done. The patient failed to follow-up and came 6 weeks after the initiation of imatinib with OS recurrence of florid NVI and vascularization of the bleb and VH with IOP 12–14 mmHg in both eyes. PRP augmentation was done in the right eye. He maintained a tight glycemic control on a customized oral regimen. Later, he underwent OS vitrectomy for non-resolving VH. 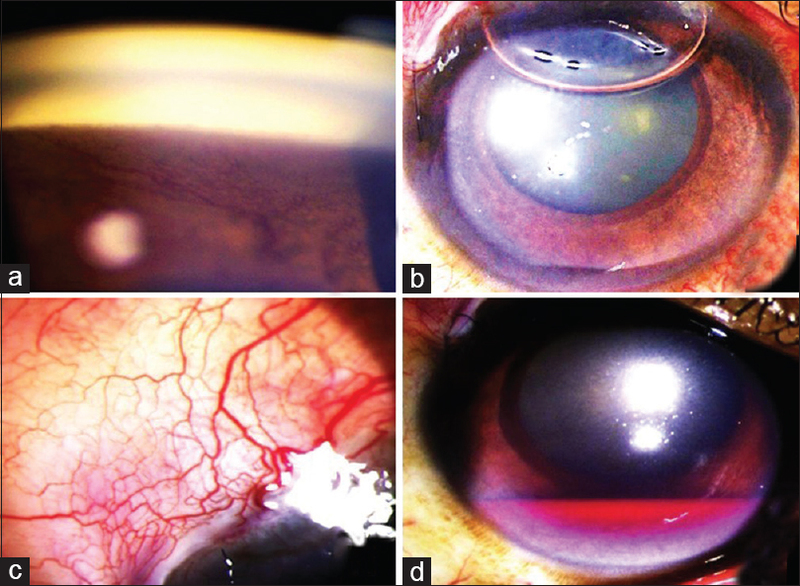 Three weeks later, he presented with OD: spontaneous hyphema of 3 mm height [Figure 1] with raised IOP (36 mmHg). Anterior chamber wash was done and maximal antiglaucoma medications were started. However, OD IOP remained persistently high (30 mmHg), for which trabeculectomy was repeated. Patient's IOP eventually stabilized to OD: 12–14 mmHg (no medications) and OS: 14–16 mmHg with timolol BD. The visual acuity at last visit was light perception in both eyes. The patient was on imatinib for the last 5 months, with TLCs in the range of 4500–6100 cells/μl (normal: 4500–11,000 cells/μl). The possibility of the imatinib leading to worsening of NVG was discussed with the treating hematologist. Since the patient responded well with the imatinib treatment, it was decided to continue it. A rapid recurrence of NVI and hyphema with the abrupt rise of IOP, who was otherwise maintaining a good IOP control, was an alarming presentation and it led us to look up the medical literature for a possible contribution of patient's systemic condition. The review of the literature revealed few case reports and articles addressing effects of leukemia and imatinib that can result in glaucoma.,,,,, Sharma et al. attributed the leukemic infiltration and blockage of the trabecular meshwork, leading to the raised IOP. Figueiredo et al. attributed hyperviscosity syndrome associated with CML resulting in retinal ischemia leading to upregulation of vasoproliferative factors including vascular endothelial growth factor (VEGF) and hence, rapid progression in diabetic retinopathy (DR) and NVG. Gulati and Saif reported a non-diabetic 62-year-old male, on imatinib (400 mg OD) for gastrointestinal stromal tumor, developed retinal neovascularization, and hemorrhage after 7 months of initiation of treatment. A dose reduction to 200 mg OD resulted in resolution of hemorrhages without affecting efficacy of drug. They postulated a dose-dependent side effect. El Naggar et al. reported a case of a 64 years diabetic female, diagnosed with CML and on imatinib, developed aggressive bilateral NVG within 1 month of initiation of treatment. They proposed that CML induced hyperviscosity had initiated/aggravated retinal ischemia and imatinib may actually have prevented the total vision loss by improving hematologic parameters of patient. Dose-dependent toxicity of imatinib has also been proposed to cause the retinal neovascularization and hemorrhage. However, progression within weeks in our case rules out dose-dependent adverse reaction. To summarize, it is apparent that patients of CML are at a high risk of loss of vision due to development of NVG as well as retinal involvement. While CML itself seems to be main culprit, the role of imatinib cannot be ruled out. Though there are several proposed hypotheses, the exact mechanism of imatinib-nduced progression of NVG is not known. However, it is worth noting that CML patients on imatinib therapy should have regular thorough ophthalmic evaluations, especially if diabetic. We would like to acknowledge the help of Professor T. Velpandian (Department of Ocular Pharmacology, Dr RP Centre, AIIMS) for his valuable inputs. Rennie I. Ophthalmic manifestations of childhood leukaemia. Br J Ophthalmol 1992;76:641. Sharma T, Grewal J, Gupta S, Murray PI. Ophthalmic manifestations of acute leukaemias: The ophthalmologist's role. Eye (Lond) 2004;18:663-72. Breccia M, Gentilini F, Cannella L, Latagliata R, Carmosino I, Frustaci A, et al. Ocular side effects in chronic myeloid leukemia patients treated with imatinib. Leuk Res2008;32:1022-5. Fraunfelder FW, Solomon J, Druker B J, Esmaeli B, Kuyl J. Ocular side effects associated with Imatinibmesylate (Gleevec). J Ocul Pharmacol Ther 2003;19:371-5. Figueiredo LM, Rothwell RT, Meira D, Fonseca S. Chronic myeloid leukemia diagnosed in a patient with uncontrolled proliferative diabetic retinopathy. Retin Cases Brief Rep 2015;9:210-3. Gulati AP, Saif MW. Retinal neovascularization and hemorrhage associated with the use of imatinib (Gleevec(®)) in a patient being treated for gastrointestinal stromal tumor (GIST). Anticancer Res 2012;32:1375-7. El Naggar AA, Shama A, Zaki NE, Nader B. Bilateral visual loss in a patient with chronic myelogenous leukemia after initiation of imatinib therapy. J Leuk (Los Angel) 2013;1:119. Li W, Yanoff M, Liu X, Ye X. Retinal capillary pericyte apoptosis in early human diabetic retinopathy. Chin Med J 1997;110:659-63.